Special Fall Rates September through October. Click here to Book Direct and $ave! Book ahead! Did you book via Expedia, hotels.com, Booking.com etc? See above! All En-suite rooms now feature King Size beds! And here’s one quick video overview of some of the things to do in our City..
Money Magazine Rates St. Augustine Best Value! Please be aware that we are on the second floor of a historic building and have no handicap access. In order to ensure that everyone gets a good night’s sleep, NO BACHELOR/BACHELORETTE PARTIES ALLOWED! For the latest Pirate Haus News, find us on Facebook. Welcome to the Pirate Haus Inn. 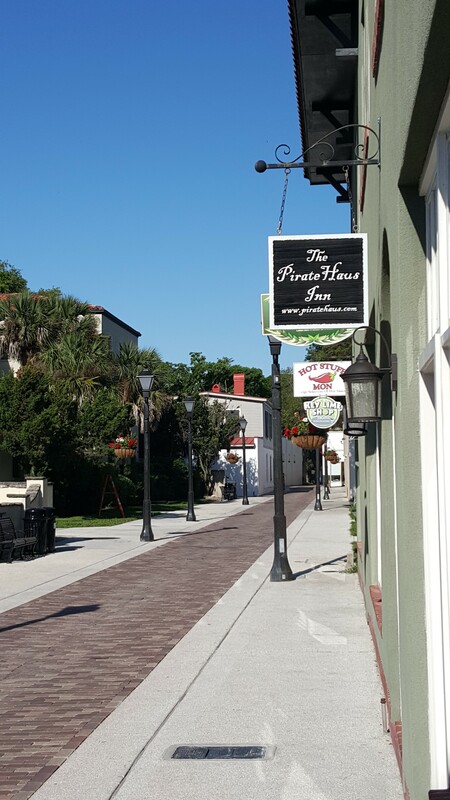 The Pirate Haus Inn is a family friendly Budget Bed and Breakfast in the heart of historic St. Augustine, Florida. Capn’ Conrad runs this ship along with an assorted and motley collection of miscreants. We are a highly-rated BUDGET accommodation. We are NOT the Hilton, Hyatt or the Ritz. Our goal is to provide affordable accommodation in the center of the historic district. If you prefer standard box hotels/motels, then by all means stay in one. The same goes for Froo froo B and B’s with 5 course breakfasts. We just offer pancakes coffee, tea, juice (orange and cow). Many of our return guests have become like family over the years and we hope you will too! How can our prices be so low in the Historic District? We Keep It Simple. (please click on link to see what i mean.) We have 6 individually themed rooms, all with their own private bathroom. We have one other room (Room #1) which has a shared bathroom and free city garage parking (a 10 minute walk) and because of these inconveniences the price is $20-$40 less than other rooms. Three face the courtyard and three face newly revamped Treasury Street. What sets us apart from most other places is our multinational clientele and the willingness of our guests to interact amongst each other. We also have a kitchen which is available for guest use after 10AM, since eating out with a family of 6 can get expensive! Concerts at the Amphitheatre click here for schedule!